I was reading Ayn’s post over at Little Illuminations about kindergarten readiness and I found myself inspired to write a comment that was as long as her original post so I moved back here to write about kindergarten readiness, which I know is on a lot of parent’s minds about now. Ayn writes about her focus on self-help skills like putting on jackets, zipping up, and putting on shoes, as well as knowing vital information like their own last names, their parent’s first names, their addresses and phone numbers. I don’t currently teach most of these things, at least not consciously, although I did teach these skills as a parent. She’s inspired me to both make sure my kids know these things, but also to think about what kindergarten readiness skills I am trying to teach. Children who can focus on a single activity, even one in which they might not at first be interested or with which they struggle, for 20-30 minute stretches will be ready for the kind of curriculum that naturally emerges from the 10+:1 child-adult ratios found in kindergarten. As a teacher, when you alone are responsible for so many kids, you need them to have the capacity to engage in activities – even “challenging” ones – without a ton of adult guidance or persuasion. We begin teaching this skill with circle time and our small group activities when the children are in the Pre-3 class, stretching them out as they get older. We extend these concepts even more in our Pre-K class by gently compelling each child to at least peripherally engage in each of our “station” (art, math, puzzles, journals) activities each session. Even when a child steadfastly refuses to participate in an activity, they are at least forced to argue against it, which is a form of engagement. Ultimately, they always have the choice to quietly read a book. Each year 2-3 kids give this option a try, but it rarely sticks for a full 20-30 minutes. Most of the kids gamely try everything, even if they struggle or it doesn’t engage them on a passionate level. I like my Pre-K kids to be confident in front of an audience. I make sure each of them has a turn in front of the class at least once a week during their 4-5-year old year. Public speaking is like a muscle: exercise it, or it will whither. It doesn’t have to be a nerve-wracking experience. Raising hands is the entry level version of public speaking, but during their Pre-K year they find themselves in front of the room during their weekly “sharing time” (show and tell) as well as during “journals” (I read their journal entries to the class). By the time they “graduate” they will have had 3 opportunities to sit in the “birthday throne” to talk about their lives, and an unlimited number of opportunities to present their stories from the front of the room. I suppose there’s a much longer list, but these are the highlights. Like Ayn, I’d be curious to learn what other readiness skills you’ve found important. And this week we broke out our amazing collection of magnetized toys for the first time this year, which dominated the classroom for a couple days. 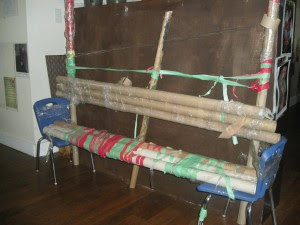 We introduced Chinese New Year, went on a field trip, and explored new outdoor "toys" (e.g., logs, cedar rounds, terracotta pots, a step ladder, wicker garden furniture). And we even went an entire week without playdough, instead investigating the properties of what we call "floam." With all that newness, I thought it would be useful to insert some familiarity, so we revisited gutter, tube and ball play this past week. 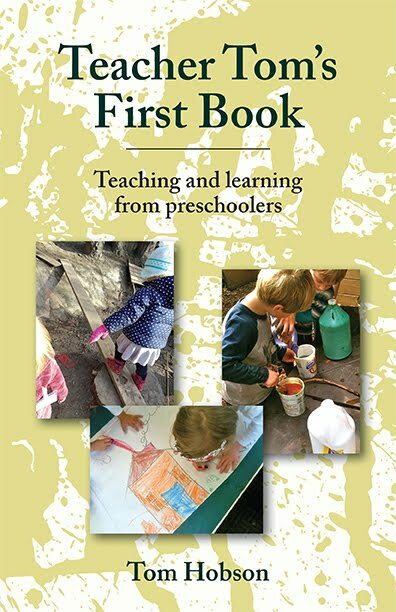 In the 3-5 class, the older kids mostly steered clear, leaving the field to our 3-year-olds who resorted to more "square one" type experimentation, both with the concept of gravity and ramp construction, as well as their social relationships. There was quite a bit of frustration over things getting knocked down, tennis ball hoarding, and taking turns, which is less evident when a more experienced 4-year-old is taking charge of things. They stuck to it, however, figuring out things both on their own and with the help of adults. The 2-year-olds, of course, love rolling balls down the gutters and through the tubes, but mostly needed adults to help them create constructions that actually took advantage of gravity. When left to their own devices they found that just throwing the balls or climbing into the emptied block cabinet was far more compelling play. That all changed on Friday when the classroom was augmented by the presence of 5 kindergardeners, older siblings who had the day off from public school. It was wonderful to watch these big kids, gently steer the gutter and tube play into more complex channels, helping to not only create multilevel ball runs, but also holding the whole rickety thing together while their younger friends experimented with the creation. I admired the way they confidently and kindly played the role of teachers. But that wasn't the only place the big kids helped us out yesterday. I watched as 5-year-old Venezia help her sister Sadie paint her dragon, going so far as to guide her brush to blank parts of the canvas. Jody's big sister Cora demonstrated how magnets both attract and repel. Violet's big brother Elliott role-modeled raising his hand at circle time (a concept that I've not yet introduced to the 2-year-olds). Sena's big sister Ava, helped expand our knowledge of how to build things from floam. And Zachary, Sylvia's big brother, made sure to not pedal our unicycle merry-go-round too fast for the younger children. Thank you kindergarden kid teachers. Come back any time. You made even the old stuff new again. Yesterday I wrote about our classroom Chinese dragon discussion and the idea that these powerful mythological creatures are "flowing through our minds" as we engage with the world. 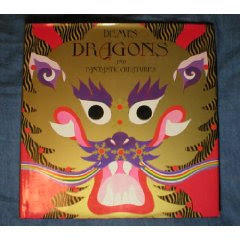 I like to use this discussion as an inspiration for painting our own dragons for Chinese New Year. I only do this twice a year, pre-drawing figures to serve as targets for paint. (We also spend an art session just before Halloween painting jack-o-lantern faces.) I have mixed feelings about this, of course, coming from the perspective that the best preschool art projects tend to be those that involve a certain set of supplies and a place to work, then letting the children do with them what they will. On the other hand, I've found that providing "targets" like this often attracts kids to the art station who don't ordinarily take the time. I've experimented with pre-drawing various styles of dragons over the years, finally settling on this loose, cartoon-y version. The more artful and fierce looking types made some of the kids uneasy, and the ones with identifiable emotional expressions seemed to steer their imaginations too much. I like that some children see this as a happy face, others an angry one, some surprised. It's not exactly a blank canvas, but close. Whatever it's relative merits as an art project, the real purpose of this activity is get the children dreaming up their own dragons. We used my favorite undiluted liquid watercolor and regular, fat classroom brushes. I posted the book Demi's Dragons And Fantastic Creatures on the wall, open to the four-page fold out of the Heavenly Dragon to remind the children of our conversation. In a comment to yesterday's post, Maya reminded me of what Katherine said about this particular dragon: "Maybe that's the dragon that keeps all of our memories." What an amazing thought. Anyway, on to the paintings. Lachlan has always been a guy deeply interested in and connected to emotions. His Storm Dragon may have been inpired by Finn V.'s dragon, but I also want to consider his piece in the context of emotion. I'm interested in how carefully he painted to the edge of his paper on one side, while leaving the other side virtually untouched. Chalie L., however, did paint an emotional piece, in this case the Mad Dragon. I like the angry energy of his brushwork. Sarah painted two Daisy Dragons, both of which were heavily worked canvases, using a lot of dark, cool colors. Daisy, she explained, is the name of her "favorite" stuffed doggy. Our international tape-off challenge has moved onto another continent. Check out this entry from Australia. As you'll note Jenny has a clear advantage in terms of "length" of tape being used given that she's moved the playing field outdoors (where she likes everything). This might prove to be an insurmountable development. The Woodland Park kids continue to debate about whether they are making a tape dragon or a tape house. I've given them several squares of chicken wire to use as targets, which I'm assuming can at some point in the future be shaped into whatever we want. Yesterday I shared the book Demi's Dragons And Fantastic Creatures with the children. I first read it as one of my Chinese New Year books many years ago after having found it at the library. I must have been lucky because it hasn't been available since. Demi has written and illustrated many wonderful books, but none as magnificent as this. I don't understand why it's out of print, but at the time I wound up paying $75 for my copy, although I see that it's available today via Amazon for much less. Unlike the essentially evil European dragons, the dragons of Chinese mythology are symbols of power, strength and good luck. I use the word "metaphor" and tell the children that the Chinese imagined that these wise, benevolent, yet slightly frightening creatures live within and control every aspect of the world. Demi depicts such figures as the Mountain Dragon, the Thunder Dragon, the Creative Dragon, The Earthly Dragon, and the Fire Dragon, with their fantastically marbleized bodies, fangs, whiskers and long tails. As I open the beautiful three and four panel fold outs, I tell the kids the name of the dragon, then elicit their comments. I try to keep the discussion on topic as best I can, but it tends to be a rather wide-ranging affair as one might expect with creatures as magnificent and powerful as these. Some of the kids ask questions of vital concern, such as Alex's question about the Heavenly Dragon: "Is that one a girl?" Others want to know what those "balls" are (pearls of wisdom) or if dragons are real (only in our imaginations). Some insist they've seen these dragons, like Marcus' spotting of the Mountain Dragon while hiking in the mountains with his family, or Katherine's glimpse of the Fire Dragon while camping. Lachlan told us about the Fire Dragon he saw flying away when the fire truck arrived at a neighbor's house. Demi describes the Creative Dragon as one that "flows through your mind," which is a descriptive phrase I use for all of the dragons. Many of the children pick up on the phrase and use it in their comments, like Thomas did when telling us about a thunderstorm he experienced while on a family trip to Spokane: "The Thunder Dragon was really flowing through my mind! And the Lightening Dragon too!" As happens every year, the conversation could have gone on for an hour. I've found the beauty of the illustrations and the magic of dragons to be a powerful combination. Today we begin the "rushed and frantic" process of getting ready for the New Year (February 14). There is cleaning, and cooking and decorating to do. We will prepare our red banners, buy "new" clothes, and wish good luck to everyone we see. And, of course, we will bang our pots and pans (firecrackers are illegal in the city limits) to frighten away the evil spirits. But before we can do any of this, we must create our powerful classroom dragons to protect and inspire us. I'll share our creations with you tomorrow. I've written before about my family's chagrin at the notion of my singing in public. And if you've been following along these many months (and who hasn't?) you'll know my epic and inspiring tale of moving from shame to shameless in my willingness to display my poor musical abilities before audiences both willing and otherwise. Lest you think I'm merely being self-deprecating, Jack's dad Karl (a barbershop singer in his spare time) recently responded to my apology to him for offending his ears by saying, "You're not exactly a bad singer, but you do tend to change keys at the beginning of each line, which makes it kind hard to sing along. Once you've chosen a key, however, you're not so bad." This is the highest compliment I've ever received as a singer, other than the time a former girlfriend compared my voice to Andrew Gold's (look him up to enjoy another laugh at my expense). Music is important to all of us and I know few people who don't have a collection of recorded music or a favorite music radio station. If you ask adult people what they like about their music, most shrug and say something like, "It makes me feel good," or "It takes me back," or "It feeds my soul." I have a lot of friends who will tell you it's all about how it fills their body, making them want to dance. Some love making their own music. They have a piano or guitar at home which they say relaxes or inspires them. For most of us, however, the music we we make or enjoy on a day-to-day basis is something we do alone, like singing along to the radio while driving, or perhaps with family members (less critical ones than mine!) and that's a beautiful thing. But the luckiest ones, to my mind, are those of us who get to regularly raise our voices with those of others, be it in praise of god, as a member of a barbershop quartet, or in the company of preschoolers. I'm sure there are all kinds of academic-y explanations for what singing together does for people, but for me it's about creating a moment of unity or oneness with my fellow humans. When our voices rise together in song, be it a Top 40 ditty or a funeral dirge, we do so as a single entity, every voice an equal part of a the greater whole. Every great community needs its songs of unity, be they anthems, fight songs, or the hymns of praise. There was a time when corporations had company songs. Employees are probably too cynical these days, but I still think it's a pity those have gone away. All preschool teachers sing with their children, and if they don't they should. Nothing draws a class together better than singing. With the 2-year-olds it's all about singing the same songs over and over. I've never done the math, but I doubt we have more than two dozen songs in our repertoire, cycling through the same tunes again and again with little variation. Two-year-olds are all about the greatest hits, often complaining if I skip their favorite. Yesterday, as we sang If You're Happy And You Know It yet again, I was taken by how loudly and boldly these little guys were singing, especially Elliott whose voice rose above the rest, off-key, of course, in classic Teacher Tom style. Yes, I was holding up photographs of children with "happy," "sad," "angry" and other expressions working on helping these children, who currently straddle the divide between parallel and interactive play, identify some of the more obvious emotional cues that they'll need for successfully navigating their expanding social world. And yes, each time we sing, "clap your hands," or "stomp your feet," we're giving them practice in the fine art of following instructions. But the real significance of the song is that we're making that song together. With the 3-5 class we also cycle through our larger core collection songs, but as is appropriate for these older children, the songs become more elastic, stretching and bending to suit their growing comfort level and need for variety. Many of the songs we learned as 2-year-olds now have pauses during which the children raise their hands to suggest their own verses or variations; we've moved from merely singing together, to actually composing new songs based upon the old, right on the spot, like a preschool jam session. Sometimes we even make up brand new songs of our own, like during yesterday's hike back from the bus stop when Marcus suggested that we "Stomp, stomp, stomp," "skip, skip, skip," and "hop, hop, hop." It helps that we all by now know a collection of simple tunes to which we can insert new words. I'm the most unlikely song leader in the world, and I love it. Wanna sing along? I'll teach you to do it off-key. While I continue to envy preschools with the good fortune to be located within or adjacent to a tract of the natural world in which their children can hike and explore, the advantage of an urban location is the ability to easily take the bus to places we want to go. Yesterday, we hopped the 44 down into Ballard where the Snoose Junction Pizzeria opened early especially for us. We could have taken the 5, which has a stop within a block of the school, and transferred to the 44, but then we wouldn't have had the 1-mile hike necessary to build up an appetite. "Don't go into the street in front of a car or it might hit you and it'll hurt." "We have to look both ways before crossing the street." "I don't want your mom to be mad at me, so don't let a car run over you." I've seen 2-year-olds wander into the street, but I'm not particularly worried about the kids in the 3-5 class. They've grown up in the city. They all know to look both ways before crossing the street. Some of them prefer to hold an adult's hand, but those with younger siblings in strollers are well accustomed to crossing under their own steam. They know to wait for the "Walk" signal at controlled intersections and to stay on the sidewalk. They're pretty savvy about the danger of cars, which, frankly are easily the biggest danger children face in a city. The excitement of going out and about in a large group like this can cause momentary lapses in judgement, like the three boys, holding hands, who decided to run together across one intersection. The unfamiliarity of being connected to one another caused them to veer slightly into the street, where a garbage truck was slowly making its way toward us, but a parent was on top of things, corralling them back onto the straight and narrow, giving me a chance to say to nobody in particular, "If you get run over by a garbage truck, you'll be flat and I'll have to mail you home." Thomas answered, "You wouldn't be flat, you'd be dead." Sarah agreed, "Yes, Teacher Tom, you'd be dead." Annabelle added matter-of-factly, "And it would hurt." These kids spend much of their lives within a few feet of chunks of metal, weighing a ton, hurtling along at deadly speeds, some of which are being "controlled" by 16-year-olds. All of us in the city do. We worry about pedophiles and uncovered electrical sockets and knives, but tend to be rather blase about this very real agent of death and dismemberment whizzing about us. That's because we've all taken great pains to actually teach our children how to safely navigate our urban terrain, just the way all of us growing up in South Carolina knew how to identify and avoid poisonous snakes and rabid dogs (I'm not kidding). Danger and our perceptions about danger are clearly a relative matter. The same parents raising kids in this environment also erect safety gates at the tops of stairs or forbid their child's playing in a home where weapons are kept, even under lock and key. I'm not judging these parents, I'm just pointing out that we all make our own risk assessments in deciding with what we are and are not comfortable. Gever Tully over on the fantastic Tinkering School blog has recently coined the term "dangerism," to describe how a culture decides what is and isn't dangerous. He uses the example of the Inuits who start teaching their children to use knives as toddlers. All of us own sharp knives, but most of us just keep them out of reach of our 3-year-olds because they don't have the need to learn to cut their own seal blubber. This is what makes knives dangerous: most of us haven't taken the time, or found the need to teach our children how to use these tools with the kind of caution we've taught them to have around traffic. So, what is the right answer? I’m not sure that I have all of it, but there has to be some accounting of the merits of an activity when assessing the value. We can’t let our fears of what could happen prevent us from letting children engage in meaningful activities. We must assess the risks, weigh the benefits, know the child, and know ourselves – then we just have to try to make the best decision we can. On my first day as coach of the Yahoos baseball team in Wolfsburg, Germany, I told the team, a collection of men in their twenties, "All it takes is for one player to tell me they don't want me to continue being coach and I'll quit being coach." I'm not sure what inspired that declaration, although I suspect it had to do with my ambivalence about taking on the responsibility with my very limited German language skills. Certainly I would piss someone off, which would, in turn, get me off the hook for speaking a foreign language in front of an audience of native speakers several times a week. As it turns out, I did occasionally piss guys off, but it never lead to anyone suggesting I take a hike. Instead it turned into to a ton of talking until our differences were settled. Sometimes it came in the form of formal meetings and sometimes while cooling our heels in the dugout. Sometimes it was friendly chatter and other times it came out in yelling and insults. Email was still just monochromatic green letters reversed out of a dark screen that I used to communicate with my loved ones halfway around the world. And I refused to participate in these discussions over the phone because my German was bad enough that I still relied on reading body language and facial expressions to fully understand people. Honestly, I hated all that talk. Hated it, hated it, hated it. There were days when I wished that someone would just have the guts to pull the trigger on me, so I could wash my hands of the whole thing. I thought about quitting, but we were winning games and having fun most of the time and I knew I would regret it. When we won our division in my second year as coach, qualifying us to move into the nation's top league, it all seemed like it had been worthwhile, even if the hardest work had taken place off the field. This was my first real experience with "consensus" as a governing philosophy for a large group of people. It arose in an impromptu fashion and was carried out informally, but whenever there was a big decision to make, or a beef to address, everybody who wanted a say got one, everyone was listened to, and in the end nothing happened unless everyone either agreed or at least agreed to set aside their objections. It was messy, emotional, and one of the most draining processes imaginable. And in large measure it all came directly out of that declaration that any single player had the power to fire me. We had to either talk or blow the whole thing up. Our cooperative preschool's bylaws require that we operate on the democratic principles of majority rule, but in practice we function largely on consensus. Over the past 8 years, we've had many long, contentious discussions, but even so, it is very rare for any of our votes to wind up being anything other than unanimous. As annoying as it is sometimes, as aggravating as it can be to delve into what one person considers vital, but sounds to others like minutiae, as teeth-grindingly frustrating as it might be to yet again go over someone's "salient" points, talking works. Last spring, the Seattle Public Schools announced plans to re-work their start times and many parents of older children were worried that it would interfere with their ability to make it to preschool on time, so we shifted our start time from 9:30 to 9:45. Within a couple months of the start of school this year, however, many parents began to wish to go back to a 9:30 start. It was clear we had the votes to make the change, which would have been "constitutional," but our board decided to go for consensus instead. We'd set aside a chunk of time at our parent meeting to allow everyone to speak. Several parents made their cases for switching back to 9:30. A few told us that they'd built their lives around a 9:45 start time and were struggling to make it on time as it was. Concessions were made, carpools formed, and finally Kimberly agreed to cover the first 10-15 minutes for Leslie on her workdays, and it was done. We had consensus. We have a couple of significant matters on the horizon at Woodland Park, one exciting and positive, but requiring consensus, and another that threatens our policy of inclusion, something I consider to be at the heart of what makes our school special. I'm not looking forward to it, it's going to be exhausting, but if we're going to live together, we're going to have to get talking. A few days ago, Caroline over at Learning Parade posted about a community art project based on the art of Sean Scully at the Ulster Museum in Belfast. We do quite a number of group art projects at Woodland Park, most of which involve scads of kids working a single "canvas" over the course of a morning, day, week, or even month. Often we "create" another kind of communal art when I gather up a dozen or so individual works and display them on a bulletin board in a way that, I think, brings out the beauty and/or genius of the artwork. This project caught my fancy because it seemed to have it all. The idea is simple: prepare small rectangles of cardboard with a few strips of double-sided tape, then break out the yarn and scissors. I precut a bunch of bits of yarn to lengths I thought would be manageable, but the kids were free to snip their own lengths as well. We've never used doubled-sided tape like this before, and it won't be the last time. As much as I like glue for collage projects, let's face it, it usually is all about the glue, rather than the purposeful arrangement of the items being glued. Even glue stick, for many kids, is a medium unto itself. Not that there's anything wrong with that, but this technique really gets their attention focused on other aspects of the artistic process. The original idea was to wrap the yarn around the card, making sure it hit the tape enough to hold it together. I was planning to use my post today to detail the 100 percent guaranteed Teacher Tom 3-Easy-Step Program for gently and joyfully getting children to eat their vegetables, take their naps, stop whining, play nicely, use indoor voices, keep their fingers out of light sockets, and grow into teenagers who will willingly mow your lawn and wash your car. But something far more important came up. There comes a time in every teacher’s life, I suppose, when everything he has worked for, everything he believes, everything he has tried to create for himself and the children he lovingly teaches is tested, and he finds the very ramparts of his soul besieged. To be honest, I haven’t felt this way since Bill Broom suggested that he was rubber and I was glue, causing, in his devilish formulation, my words to bounce off him and stick to me. Of course, I want to howl into the abyss at my fate, but just the way I pulled myself together to answer Bill Broom with a decisive, “Uh uh, you’re glue!” I will rally to face this new trial. It seems that Miss Pamela, writing over at Leaves & Branches, Trunk & Roots has challenged Woodland Park to a “tape-off!”. Like I said, I can be competitive about important stuff. Lately, I’ve put a lot of thought into a significant revamping of Woodland Park’s playground, or more accurately, Jenny over at Let The Children Play has been doing a lot of thinking about revamping her outdoor play space and sharing it on her blog, which has inspired me. I’ve just submitted a proposal to our boards, which if implemented will result in a wholesale repurposing of our little courtyard and garden, leading, I hope, to major changes in how we approach outdoor play. I’m excited about those prospects, but I’ve been reminded this week how even small changes can make a big difference in the play that takes place in a classroom. My wife and her business partner spent part of the MLK Day long weekend clearing out some old offices and disposing of a bunch of unsaleable items left over from photo shoots. I went in to help move some of the heavier stuff. Seeing this stash of "garbage" brought out the middle class bag lady in me, and I got in some terrific scavenging. For instance, this week we’ve been playing with a set of prop lap top computers. These are the cheap, plastic faux computers furniture retailers might put on a desk in a window display. On Tuesday, 2-year-old Charlie M. took a pair of back-to-back knocks to the head, not hard, but definitely blows to his sense of safety and dignity. He was inconsolable until I had the idea of popping open a pair of these machines, with their cardboard “Windows” screens. I've never seen such a fast transition from tears to joy. The computers were not manufactured with children in mind, so I fully expected them to get destroyed this week, but amazingly they seem to be still going strong. I think it’s because that after a few minutes of pretend key pressing, they lose their play value, while retaining their ability to “set the office mood,” you know, like props! I also picked up a few dozen electric “tea candles.” When lit, the little low-wattage bulbs flicker, creating the effect of real candles. I’ve been arranging them, a few at a time, along the top of our fireplace mantel (an idea I borrowed from Kristin over at Preschool Daze). It was encouraging to watch with what caution the children approached the candles, even though I assured them they wouldn’t get burned, but once they realized they were safe, these little lights have been integrated into all kinds of activities. At one point I noticed them lighting up the dark crawl space under our loft. Later several of them were giving a romantic glow to our snack table. They were employed as torches and other dramatic play elements. We’ve suddenly had superheroes energetically performing “rescues” these week. We haven’t had a lot of superhero play so far this year, but the advent of a clutch of scavenged swim goggles really kicked their super imaginations into high gear. Ella was the first one to don a pair of these smoky lensed props, declaring herself simply “a superhero.” She has been leading teams around the room this week, looking for wrongs to right and rescues to perform, often bearing tea candles or cell phones as aids to their magnificent feats. And, of course, we have been wrestling which I wrote about yesterday. To be honest, Wednesday’s session lead to far more tears than even I'm comfortable with, and I'd been reticent about continuing for a second day, but pulled myself together. We had a brilliant group discussion about the wrestling rules at circle time, including introducing a new rule about pushing people down. A few children raised their hands and declared that they would not be wrestling based upon what they had learned on Wednesday, but about half of them returned to the mats, having twice as much fun and virtually no tears during this follow-up session. Obviously, some real learning had taken place. I’m still fired up about our prospective big changes, but I’m almost as excited about the remaining bags of small scavenged items still waiting in the wings, and the big changes that come with them. During the weeks leading into the December holiday break and for these first couple weeks of the year, as often happens, spontaneous wrestling as been breaking out in the classroom. Not fighting, but the kind of roughhousing engaged in joyfully by consenting children. While it’s inappropriate behavior during, say, circle time or amongst the towers of wooden blocks, I knew it was time to introduce the appropriate time and venue. Wrestling has been a part of our curriculum for the past several years. After discussing wrestling at circle time, then running through the rules in preparation for our first matches of the year, we hit the mats. As generally happens, the moment we make wrestling a sanctioned activity, girls jump right into this stereotypical “boy” activity with a comparable gusto. During this inaugural half-hour session, I would estimate that a full ¾ of our group gave it a go, while ¼ stayed on the mats wrestling the entire time. As referee, I kept up a running commentary on what I was seeing, much of which involved reminders to follow the rules, like, “No hands in people’s faces,” “No wrestling with someone who is not on the mats,” and “Stop when someone says ‘Stop!’” I kept my eyes on their faces, looking for winces of pain or signs of anger, but mostly saw red-faced ear-to-ear grins, even when at the bottom of a four-child pile up. This isn’t to say there weren’t minor injuries, most involving the inadvertent knocking together of heads, which is one of the natural consequences of wrestling. And while I consider “pushing” to be a normal part of wrestling, it got a little out of hand, with several instances of children being pushed off the mats and onto the carpeted, yet harder floor. For some, their bumps were enough to give up the game and head outside, but many “took a break” for the tears to subside, then waded right back into the game. This experience under our belt, we’ll take some time today to discuss what we liked and didn’t like about the wrestling experience before our second session. I’m expecting to devise a new protocol surrounding the pushing (i.e., “You may pull people to the ground, but not push them.”), and a caution that we only wrestle at preschool, on the mats, with people our own size (this necessitated by my learning that one of our boys tried to recreate his fun experience last night at home with his much younger and unwilling brother). Up until this year, I’d believed that we were the only preschool on earth that engaged in wrestling as part of our curriculum, but I was thrilled to learn that I was wrong when Jenny posted this article over at Let The Children Play, where I’ve been avidly following her amazing exploration of outdoor play and playgrounds. Each time I post something here about the enthusiasm and involvement the Woodland Park’s parent community like I did yesterday or last month, I’m showered with comments and emails from teachers impressed with how well our parent community understands and supports our play-based curriculum. Several times I’ve even been approached to help create or review methods or systems that seek to measure and report the success of play-based education as a way to convince parents and establishment-types that what we’re doing is indeed education. I feel so blessed to work in a place where the inherent educational goodness of play is a given; a place where parents are right there with me as daily witnesses to their children’s learning. As a teacher, I’ve never felt the compulsion to “sell” our program or its benefits in any way other than to be the best teacher I can be. Up until relatively recent times, the attitude at our school was not an anomaly. It was widely understood that play was the “work” of childhood. The Industrial Revolution, however, did a number on Western society’s thinking on educating children, changing it from its historic roots as a play-based activity into a factory-style one. If you've been keeping track of this little corner of blog-space for any length of time, you know that I'm a cooperative preschool evangelist, ready at the drop of a hat to tout the wonders and benefits of our model of early childhood education, especially when it's combined with a multi-aged classroom and a progressive, play-based curriculum. This weekend Cheryl, the mother of Elliott (who is now a kindergardener in a cooperative primary school) and Violet (a current student in our Pre-3 class) wrote me the following note after a morning of managing our sensory table which hosted a mixture of sand, coffee grounds and yellow corn meal. This really captures the essence of what we're trying to do at Woodland Park from a parent's perspective. I just wanted to tell you how much fun I had today in class. Seems kind of funny as a parent writing to the teacher, but today was fun for a variety of reasons. First, come on, we were playing with dirt. Got to love that. But secondly and most importantly, it was so interesting to watch how the play was evolving. Connor, most of all, was really into seeing how much he could do with the two piles of dirt. It started with just the digging and the raking. Naturally, throwing it up in the air became an experiment, as did spraying each other with the water bottle. Ultimately all the dirt ended up on one side to build a mountain for the toy people to climb and then get buried.
. . . I had forgotten how quickly the game changes, or how it blossoms into something unexpected. It felt like a journey, and I felt so lucky to be there with our preschool friends, shoulder to shoulder, dirt up to our elbows. By the way, and this might be too much information, when I got home and changed there was even sensory table dirt in my brassiere. Anyway, it was such fun. Man I love our preschool! Cheryl has been coming to our preschool now for 4 years and I'm expecting her to be with us for another 2. At this point she already has more preschool classroom experience than I did when I started working here. I'm blessed to get to work alongside such dedicated and loving assistant teachers. If you're interested in more reading about our cooperative preschool, here are some other posts on the topic in order of appearance. On this Martin Luther King Day most of us will listen to snippets, perhaps all, of his great "I Have A Dream" speech, but civil rights was not the only cause this great American championed, and it is not the only reason we celebrate his life today. He was also a great advocate for the poor and in 1967 he spoke out against the war in Vietnam. Time magazine called his "Beyond Vietnam" speech at the Riverside Church "demigogic slander." The editorial page of the supposedly liberal Washington Post stated, "King has diminished his usefulness to his cause, his country, his people." When I listen to this rarely heard speech, I am shocked by how applicable it is to the wars we are fighting today. I'm reminded that when the powerful are against you, you are probably on the right side of history. And as a teacher, I'm motivated by the knowledge that children do not start wars, adults do, but we send our children to die in them. I've written here both recently and in the past about how the application of the business model to education is at best useless, and at worst a real danger to our efforts to educate children to be citizens in our democracy, rather than just mere workers.
. . . despite having a zillion "sparkly things" at home, Ella clutched that "ruby gem" like it was pure gold. She carried it with her all day, and when people asked her about it, she very matter-of-factly explained that it it was in celebration of Martin Luther King and how we should be fair to everyone. Sometimes little people are much better at teaching big people! Needless to say I'm in teacher heaven right now. I may not be able to buy groceries with it, but this is the kind of payday for which teachers work. And I will be living on it through this long Martin Luther King Day weekend. I can’t remember where I learned our Shapey project, but it’s been a fixture in our Pre-K curriculum for as long as I’ve been teaching. · I am 10 inches tall. · I am 8 inches wide. · I am made of 4 rectangles, 2 circles, 5 triangles, and 1 square. We then divide into two groups with a ruler, glue sticks and a collection of precut shapes to work on the challenge. It can get pretty lively as they discuss and debate everything from who gets to hold the ruler to the size of Shapey’s space ship, but in the end they usually wind up settling on some version of taking turns. Although a few years back, one group came up with a system that involved all 4 of them holding the glue stick together, all 4 of them picking up the tiny construction paper pieces, and all 4 of them, Ouija board style, guiding those pieces into place. But the point is that they always naturally come up with a solution that is fair to everyone. Each group is usually convinced their version is the most realistic, but the only way to know for sure is to check with Shapey, who has promised to thank them in a “special” way. The following week, the children learn that Shapey is pleased with both portraits because one looks like him when he’s awake and the other looks like him when he’s asleep. Traditionally, I introduce our Martin Luther King, Jr. Day material in our Pre-K class with an object lesson in fairness by taking something like these jewels (which are really just bits of plastic from our art supplies) and imbuing them with value by making them seem scarce. In a normal year, I’ll say something like, “I’m going to give each of the girls one of these jewels,” which elicits howls of protest from the boys. I then take the jewels back and instead exclude the girls to similar effect. Tears are not uncommon. I’ll then give them only to children with curly hair or stripped shirts or other arbitrary dividing points until someone suggests just giving one to everyone. After all, that’s the fair thing to do. This year, however, something happened that has never happened before. Even before I was done distributing the jewels to the girls on the first round of the activity, Annabelle said, “That’s not fair, you should give them to everyone.” While the boys sat in silence, the girls, already clutching their prized jewels, joined Annabelle, “Give them to everyone.” I tried to continue the process of unfair distribution, but I had a mini-rebellion on my hands. Katherine said, “You should either give them to everyone or don’t give them to anyone,” and she tried to hand hers back. I felt like the segregationists must have felt. This is why I want the children of Woodland Park to know it’s okay to question authority. I’m here to teach children so that they can grow up to be well-educated citizens, and there is no more important responsibility of citizenship than to stand up to authority when it is being arbitrary and unfair. I didn’t just let them “win,” they compelled me to give up on my nefarious plans through a powerful, peaceful protest that relied on words and reason. My classroom activity was halted in its tracks. I gave them each a jewel. I’ve never been more proud of the children.